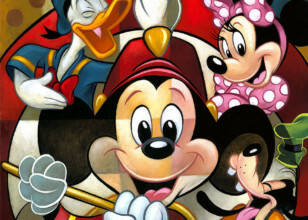 Embellished Giclée on Canvas: 12" x 36"
Mickey's Creative Journey depicts the artistic evolution of Mickey Mouse. Mickey first appeared in a test screening short (Plane Crazy). Mickey officially debuted in the short film Steamboat Willie(1928), one of the first sound cartoons. He went on to appear in over 130 films, including The Band Concert (1935), Brave Little Tailor (1938), and Fantasia (1940). Mickey appeared primarily in short films, but also occasionally in feature-length films. Ten of Mickey's cartoons were nominated for the Academy Award for Best Animated Short Film, one of which, Lend a Paw, won the award in 1942. In 1978, Mickey became the first cartoon character to have a star on the Hollywood Walk of Fame. Beginning in 1930, Mickey has also been featured extensively as a comic strip character. His self-titled newspaper strip, drawn primarily by Floyd Gottfredson, ran for 45 years. Mickey has also appeared in comic books such as Disney Italy's Topolino, MM Mickey Mouse Mystery Magazine, and Wizards of Mickey, and in television series such as The Mickey Mouse Club (1955–1996) and others. He also appears in other media such as video games as well as merchandising and is a meetable character at the Disney parks. 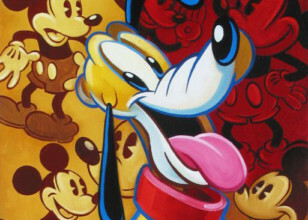 Mickey generally appears alongside his girlfriend Minnie Mouse, his pet dog Pluto, his friends Donald Duck and Goofy, and his nemesis Pete, among others (see Mickey Mouse universe). Though originally characterized as a mischievous antihero, Mickey was rebranded over time as an everyman, usually seen as a flawed, but adventurous hero. 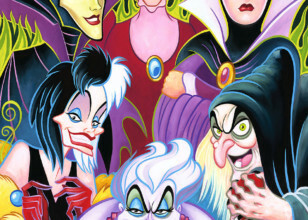 In 2009, Disney began to rebrand the character again by putting less emphasis on his pleasant, cheerful side and reintroducing the more mischievous and adventurous sides of his personality, beginning with the video game Epic Mickey.